» Agile managers – what do they do? 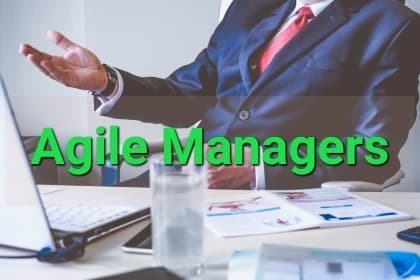 Agile managers – what do they do? People might be wondering what managers do in an Agile organisation. You might wonder if they are still needed. Agile managers aren’t measuring or forecasting anymore, because your teams should do their own measuring and forecasting. They don’t micro-manage people’s work anymore because teams are empowered to work how they want. So if we still have agile managers, what do they actually do? It turns out, they do four things. The most important job of a manager is to enable the team to do their best work. That means making sure the team has the tools they need to do their job, and any impediments are removed as quickly as possible. Teams should be empowered and encouraged to remove blockers themselves, but sometimes they do not have the technical knowledge, financial means or political clout to do so. They should then be able to call on their managers for help. This is real “servant-leadership”: serving the team and helping any way you can so that they can do their best work. Managers should always be supporting the team in their development and growth, too: organising training, funding them to go to conferences and meetups, and so on. Organizational learning is critical to the long-term success of a firm. Remember the adage: “What if we train our people, and they leave?” “What if we don’t train them, and they stay?”. Managers may need to set boundaries of what sort of activities and behaviours are not allowed in the company. These could be of different types. In a perfect world, everybody is building microservices, and they can be built in whatever language and technology you like. You can then compose “applications” out of these microservices. This isn’t always feasible for various reasons, so sometimes you need technical managers to provide guidance on what technologies to use. Otherwise, your enterprise architecture will end up like a dogs’ breakfast. This type of control is not ideal, however. The long-term direction of your technology stack should be towards serverless microservices, which allows flexibility, simplifies your infrastructure, and reduces the need for governance. Some companies operate under conditions of compliance. It could be for privacy reasons, security and payments (e.g. PCI-DSS), or one of many industry-specific regulations (e.g. Basel III for the banking industry). Teams may need rails to be set around them to ensure they are following the rules correctly. However, the best long-term solution is for the team to become experts in their domain and understand their compliance environment, so they don’t need a manager holding their hand and telling them what they can and cannot do. Most behaviour problems – people not getting along, personality clashes, and the like – are best solved within the team. Maybe a scrum master or someone takes people out for a coffee or a beer and figure it out. But sometimes that doesn’t work, and intervention is required. This could start with a manager acting as a facilitator or mediator, or if that fails, it could escalate to something more serious like disciplinary action. This might sound like harsh micro-management, but sometimes unacceptable behaviours happen in a workplace, and they need to be dealt with ASAP. Just look at the recent fiasco with Uber and the stories of rampant sexual harassment. So what else do agile managers do? A company with many teams working on related products will need someone to coordinate their activities. This doesn’t need to be someone strictly in control, but someone with a sharp view of who is doing what and where there might be conflicts or synergies. A tech manager might be looking for architectural problems, code re-use, or “tooling creep” (20 teams each with 20 different application performance monitoring tools: I’ve seen it happen). A marketing manager might be looking for inconsistent branding or messaging. An HR manager might be looking for conflicting priorities or policies around hiring or rewards. The more the company grows (both in size and complexity), the greater the need for these “air traffic controllers” to make sure the system is running smoothly. Higher level managers are responsible for choosing the direction and strategy of the company. This is a complex and difficult task and requires extensive domain knowledge, strategic thinking, systems thinking, leadership and emotional intelligence. People who can do all this can steer companies to great success. In today’s extremely complex and uncertain business environment, successful managers and leaders are using interesting new ideas such as Complexity Theory, Systems Thinking and the Cynefin Framework. They often stand on the shoulders of giants, of course. Senior managers can only make the right decisions with the right information from the right people. All teams in a company need to be working hard to create value while continually gathering data, learning and improving. The senior managers need to synthesise and analyse all that data to understand the position of the company and its products in the market. So it is not a solo performance by any means. Managers versus leaders – what’s the difference? This “Set the Course” activity is perhaps a better description of something a “leader” does, rather than a “manager”. In fact, I would say it is probably the clearest distinction between the two. Peter Drucker’s description is also illustrative: “Management is about doing things right, leadership is about doing the right things”. What about those other things managers do? Many other activities usually thought of as the domain of managers such as assigning work, performance reviews, hiring and development can be done by teams, or removed altogether. The excellent book Reinventing Organizations provides many examples of successful companies doing this. An interesting one is Buurtzorg, a Dutch home nursing care group. They operate in small self-managing “cells” of 10 to 12 people. Most of the time they have no managers at all and operate perfectly well – having barely any contact with Buurtzog headquarters. Each nurse in a cell discusses and agrees with the other nurses which patients to see, when to see them and how best to care for them. Buurtzog has only 50 managers for an organization of 4000 employees. Which of those things do agile managers mainly do? These activities have different purposes and different levels of value. Pave the Road and Set the Course are high value-add activities. They help provide a strategy for the company and help people do amazing work. Set Guard Rails and Direct Traffic are low value-add activities. They are about jumping in and stopping people from crashing into each other. They are more of a necessary evil. Managers need to spend different amounts of time on these things depending on their context. As a company grows, the amount of guardrail setting and traffic directing (low value-add activities) you will need to do grows, especially if you have a poor organisational and technical architecture. The most successful companies have an organisational and a technical architecture that means managers hardly have to do any of those things. Amazon and Netflix are classic examples of this. Both companies have small, highly skilled, empowered and cross-functional teams that can operate well with minimal direction. That is, their organisational architecture means managers need to do little Directing Traffic. They also have a sophisticated micro-services architecture that means it’s very difficult for the work of one team to break the work of another team (i.e. their technical architecture means managers need to do hardly any Set Guard Rails). The up-front investment those companies have made in their organisational and technical architecture means that managers can spend more time on paving the roads and setting the course.